Eliminate noxious sights or smells from environment. Rationale: Reduces stimulation of vomiting center. Rationale: Decreases dryness of oral mucous membranes; reduces risk of oral bleeding. Rationale: Reduces trauma, risk of bleeding or hematoma formation. Assess for unusual bleeding: oozing from injection sites, epistaxis, bleeding gums, ecchymosis, petechiae, hematemesis or melena. Rationale: Prothrombin is reduced and coagulation time prolonged when bile flow is obstructed, increasing risk of bleeding or hemorrhage. Rationale: Decreases GI secretions and motility. Observe and document location, severity (0–10 scale), and character of pain (steady, intermittent, colicky). Rationale: Assists in differentiating cause of pain, and provides information about disease progression and resolution, development of complications, and effectiveness of interventions. Rationale: Severe pain not relieved by routine measures may indicate developing complications or need for further intervention. Rationale: Bedrest in low-Fowler’s position reduces intra-abdominal pressure; however, patient will naturally assume least painful position. Use soft or cotton linens; calamine lotion, oil bath; cool or moist compresses as indicated. Rationale: Reduces irritation and dryness of the skin and itching sensation. Rationale: Cool surroundings aid in minimizing dermal discomfort. Encourage use of relaxation techniques. Provide diversional activities. Rationale: Promotes rest, redirects attention, may enhance coping. Rationale: Helpful in alleviating anxiety and refocusing attention, which can relieve pain. Maintain NPO status, insert and/or maintain NG suction as indicated. Rationale: Removes gastric secretions that stimulate release of cholecystokinin and gallbladder contractions. Rationale: Relieves reflex spasm and smooth muscle contraction and assists with pain management. Rationale: Promotes rest and relaxes smooth muscle, relieving pain. Rationale: Given to reduce severe pain. Morphine is used with caution because it may increase spasms of the sphincter of Oddi, although nitroglycerin may be given to reduce morphine-induced spasms if they occur. Rationale: This medication may be used after a cholecystectomy for retained stones or for newly formed large stones in the bile duct. It is a lengthy treatment (1–3 wk) and is administered via a nasal-biliary tube. A cholangiogram is done periodically to monitor stone dissolution. Rationale: These natural bile acids decrease cholesterol synthesis, dissolving gallstones. 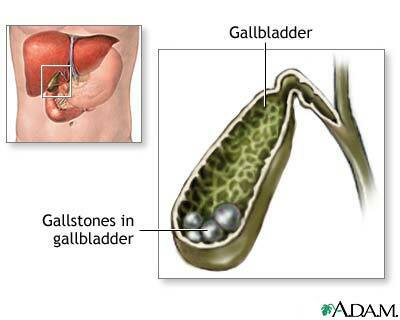 Success of this treatment depends on the number and size of gallstones (preferably three or fewer stones smaller than 20 min in diameter) floating in a functioning gallbladder. Rationale: To treat infectious process, reducing inflammation. Calculate caloric intake. Keep comments about appetite to a minimum. Rationale: Identifies nutritional deficiencies and/or needs. Focusing on problem creates a negative atmosphere and may interfere with intake. Rationale: Monitors effectiveness of dietary plan. Consult with patient about likes and dislikes, foods that cause distress, and preferred meal schedule. Rationale: Involving patient in planning enables patient to have a sense of control and encourages eating. Rationale: Useful in promoting appetite/reducing nausea. Rationale: A clean mouth enhances appetite. Rationale: May lessen nausea and relieve gas. Note:May be contraindicated if beverage causes gas formation/gastric discomfort. Rationale: Nonverbal signs of discomfort associated with impaired digestion, gas pain. Rationale: Helpful in expulsion of flatus, reduction of abdominal distension. Contributes to overall recovery and sense of well-being and decreases possibility of secondary problems related to immobility (pneumonia, thrombophlebitis). Consult with dietitian or nutritional support team as indicated. Rationale: Useful in establishing individual nutritional needs and most appropriate route. Rationale: Limiting fat content reduces stimulation of gallbladder and pain associated with incomplete fat digestion and is helpful in preventing recurrence. Advance diet as tolerated, usually low-fat, high-fiber. Restrict gas-producing foods (onions, cabbage, popcorn) and foods or fluids high in fats (butter, fried foods, nuts). Rationale: Meets nutritional requirements while minimizing stimulation of the gallbladder. Administer bile salts: Bilron, Zanchol, dehydrocholic acid (Decholin), as indicated. Rationale: Promotes digestion and absorption of fats, fat-soluble vitamins, cholesterol. Useful in chronic cholecystitis. Monitor laboratory studies: BUN, prealbumin, albumin, total protein, transferrin levels. Rationale: Provides information about nutritional deficits or effectiveness of therapy. Provide parenteral and/or enteral feedings as needed. Rationale: Alternative feeding may be required depending on degree of disability and gallbladder involvement and need for prolonged gastric rest. Explain reasons for test procedures and preparations as needed. Rationale: Information can decrease anxiety, thereby reducing sympathetic stimulation. Review disease process and prognosis. Discuss hospitalization and prospective treatment as indicated. Encourage questions, expression of concern. Rationale: Provides knowledge base from which patient can make informed choices. Effective communication and support at this time can diminish anxiety and promote healing. Rationale: Gallstones often recur, necessitating long-term therapy. Development of diarrhea or cramps during chenodiol therapy may be dose-related or correctable. Note: Women of childbearing age should be counseled regarding birth control to prevent pregnancy and risk of fetal hepatic damage. Rationale: Obesity is a risk factor associated with cholecystitis, and weight loss is beneficial in medical management of chronic condition. Instruct patient to avoid food/fluids high in fats (pork, gravies, nuts, fried foods, butter, whole milk, ice cream), gas producers (cabbage, beans, onions, carbonated beverages), or gastric irritants ( spicy foods, caffeine, citrus). Rationale: Limits or prevents recurrence of gallbladder attacks. Review signs and symptoms requiring medical intervention: recurrent fever; persistent nausea and vomiting, or pain; jaundice of skin or eyes, itching; dark urine; clay-colored stools; blood in urine, stools, vomitus; or bleeding from mucous membranes. Rationale: Indicative of progression of disease process and development of complications requiring further intervention. Rationale: Promotes flow of bile and general relaxation during initial digestive process. Suggest patient limit gum chewing, sucking on straw and hard candy, or smoking. Rationale: Promotes gas formation, which can increase gastric distension and discomfort. Discuss avoidance of aspirin-containing products, forceful blowing of nose, straining for bowel movement, contact sports. Rationale: Reduces risk of bleeding related to changes in coagulation time, mucosal irritation, and trauma. Recommend use of soft toothbrush, electric razor.